I LOVE this pumpkin pie! No surprise it got rave reviews when it was featured on Good Morning America for Thanksgiving a few years ago! Typically, a pumpkin pie is made with a regular pie shell made up of white flour, shortening, sugar and salt and the custard contains molasses, salt and sometimes butter or cream. 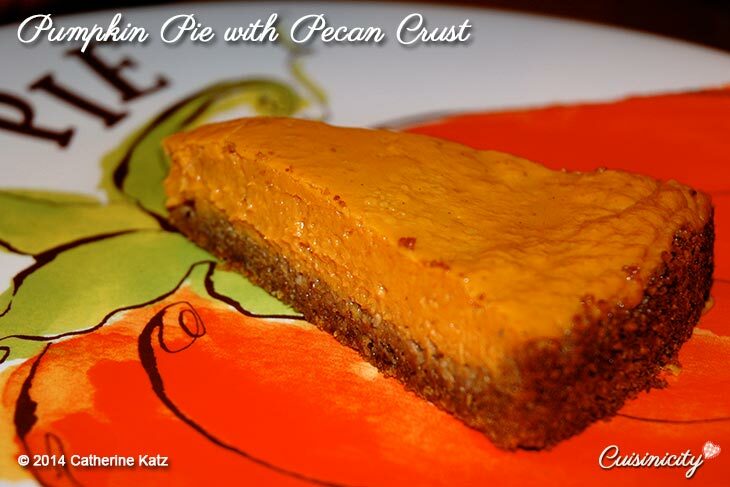 Instead, this luscious pie uses a nutty/ puffin cereal base that is more like a cookie crumb crust that adds fiber and healthy fat from pecans instead of the saturated or transfat from shortening, and of course no added salt. 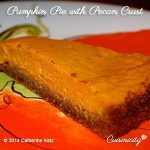 This pie also contains more pumpkin than the typical recipe calls for, so it is even richer in fiber (I like this brand but there are others). The little addition of dark rum makes it so rich tasting and just perfect! The result is a delightful (gluten-free) creamy gem of a pie you will love; and even better — it will love you back! Cuisinicity Tip: Be sure to use Barbara's Bakery corn Puffins that specify gluten-free if you are gluten sensitive. Place puffins cereal, pecans and brown sugar in food processor and grind finely. Add melted smart balance and process again. Place the crust at the bottom of a lightly greased (smart balance) 10-inch baking pan and press down firmly with your fingers to make a compact crust. Place all the wet ingredients in a bowl of an electric mixer and beat until creamy. Pour the creamy pumpkin custard on top of the crust and bake in preheated oven for 35-40 minutes. I am concerned about Smart Balance. What I have read about the ingredients does not sound good for you. Has anyone tried this without the rum? It’s fine without the rum, Denise. I would replace it with a little bit of pure vanilla extract and it will still be FABULOUS! Thank you for answering so quickly. Can’t wait to try it. Dear Catherine I attended a lecture given by your husband at a recent medical conference and he pointed us to your site! I love your recipes and have baked this pumpkin pie, the house smells wonderful and your crust is gorgeous much better than the traditional butter flour variety. I can’t wait to serve it for Thanksgiving. I will also share I did not have pecans so I substituted with walnuts and crispix (as I could not find your recommended cereal). Merci beaucoup! Catherine, I decided to make these for our next “girls night in”. I made them in individual cupcake liners and they came out great. I adjusted the cooking time to about 28 minutes and it made about 24 regular sized cupcakes/mini pies. Even my husband loved it and he isn’t a big pumpkin fan. My question is do you think I could freeze them? I want to make them ahead to have on hand, but not sure the cooked “mini” pies would freeze well? Wow Jill! What a lovely idea! I have never thought to make it that way but how yummy and fun for a girls night in!! 🙂 I LOVE IT and I am so happy also loved it in spite of not being a pumpkin fan. it doesn’t get any better than that!!! In response to your question I think the mini pies would freeze well as I know I have frozen the regular sized pie before with no problem. Please let me know if you try it. I always love to hear! Thank you again for your wonderful comment! I am printing off this recipe and eager to try it for Thanksgiving, though I will likely whip it up before. I want to do Thanksgiving, “healthy style” and hope you will continue your great recipes for the holidays! This recipe looks so good. I can’t wait to try it. I really miss home made pumpkin pie. The problems are the following: I am allergic to milk, do you have suggestions for a non-dairy substitution for sweetened condensed milk. And , I live in Brazil so canned pumpkin is not available. How would you suggest I cook the pumpkin to have the same consistency as the canned? And, no puffins corn cereal, ideas…. I do have access to all kinds of grains, fruits and vegetables. Thank you Camille!!! I don’t know that you can create this recipe without the condensed milk because, unlike a lot of my other recipes, many of them even vegan, I can’t think of anything that would replace the milk. I am so sorry! Canned coconut milk makes an excellent substitute for evaporated condensed milk. I use the full fat coconut milk, from the can, not the beverage drink, and it turns out very delicious. I’ have just discovered your website and would love to try this recipe, but what is ( ¼ cup) melted regular smart balance? I am non-American? I hope this is helpful! If you could let me know what country you are from, I can look into it further for you. Hi Catherine, I made this pumpkin pie for Thanksgiving and it was a hit! The whole family really enjoyed it. I did make one small modification. While preparing the pumpkin I realized I did not have any allspice so in its l place I used a 1/4 tsp of clove and 1/4 tsp nutmeg. It turned out very well, next time will have the allspice though! Great substitution Caleb! YUM! I am so happy you and your family loved it! Thank you for letting me know! it’s always so special to hear! We were able to make this with fresh pumpkin (our winter CSA yielded a bunch of pie pumpkins). It came out **wonderful** and our Thanksgiving hostess loved it. We had a little extra of the filling that didn’t fit in the pie, so we had a little pumpkin ‘pudding’ after our turkey trot (thanksgiving morning run with 3000 people). Our household is in the midst of ‘rehabbing’ our taste buds, so thank you very much for helping us! Wendy, I absolutely love your comments! I am going through them all right now and I am just so excited to have you join us at the Cuisinicity table! Hi- I am making this pie today for tomorrow – just wondering once cooled where/how should I store it for tomorrow? Leave uncovered in a cool pantry or a little wax paper over it? Thanks!! WOW – will be on the menu and not just for Thanksgiving!! YAY! So glad to hear it Greg!! This has been a family favorite for a long time! It will be on our thanksgiving table again this year as well! I have this recipe in the oven right now – giving it a test (for my baking skills, not your recipe) before serving at thanksgiving this year. A late follow-up; in an earlier email exchange (with Ms. Katz) I said that I was going to “test drive” this pumpkin pie recipe BEFORE Thanksgiving day. Well, as it goes I was crunched for time and decided that I could trust you and the recipe. I bought the ingredients to make 2 pies. They were incredibly easy to prepare. The pies were a hit! Silky, sweet but not too much, flavorful crust, 100% delicious! Thanks for the recipe. I will start looking through your recipes for a Christmas dinner delight! Thanks again! YAAAAAAYYYYY!!! That makes me SO HAPPY! I am so touched that you knew to trust me and that you were so happy with the results! I pride myself in always keeping my promises so this is one of the BEST comments and compliments about my recipes that I could ever receive from someone. Thank you so so much for letting me know! You made my day! Looks GREAT ….. can hardly wait to try it! 😉 Thanksgiving & Christmas are not quite the same ;-/ in Australia! … Not crisp & cold … the hot weather spoils the special atmosphere a bit. I just keep the memories of childhood in Virginia! I know what you mean Krystyna! Hopefully this will bring a little bit of that cozy holiday feeling back! Question regarding the 1/4C melted smart balance. Is it a 1/4C before I melt it or is it 1/4C after I melt it? I hope to make this weekend as a pre-test to Thanksgiving. My mom has to eat gluten-free these days, so I’m hoping this will take the place of the traditional pumpkin pie that she loves so much!